My mother is the ultimate party planner. No details are spared. Mixed cheerful china patterns, crystal from generations ago and her own floral creations that are never set too high to obstruct a conversation. Place cards are mapped after careful consideration of all the personalities attending. I enjoy taking pictures of random spoons I find or pointing out an odd looking bowl and asking her what it is specifically intended for. Ah yes, a bouillon cup...not a tea cup. A mustard spoon…not a cute little baby spoon. Can I still use it for other condiments? This all might seem superfluous for some. Why all the fuss? The company is what makes for a good party. While that couldn’t be more true, setting the tone of the evening can create a certain vibe. One that makes people feel both special and welcome. Designing an environment where folks feel at ease to interact with one another. We would then need to ask ourselves, what are captivating qualities? Or perhaps in our case, what preparations can we make to set our mind up for that focused freedom. How do you set up your physical practice? What have you physically and mentally ingested prior? We practice Ashtanga on an empty stomach because we are manipulating our insides around along with our arms and legs. It isn’t particularly comfortable otherwise. Practice the day after Thanksgiving is a bind-free zone for me. How much restful sleep you were able to get? Under six and it’s easy to feel slow and depressed. Observing these factors helps us to manage our expectations by taking a genuine interest in what your body is able to do TODAY. You can start trying different timings of your meals, taking stock of what is easy for you to digest, going to bed earlier etc and see what logistically works best for you. You might not have control over some of these things at the moment but guilt and shame have NO home here. Any bit of practice is better than no practice. Some historically recommended preparations include setting out your clothes the night before and showering before practice. Minimizing the time you need to choose clothing and cleansing your body, set a tone of formality. If you start adding an air of importance to practice then it will become a priority. What you read before practice can also have an effect. Have you ever read an article that got you fired up and then that’s all you could think about? The less mental stimulation the better! What we know to be true: Thoughts create more thoughts. All of these things can set up your intention in practice. Quieting your mind requires devotional care. I know some of these things can be extra challenging for the evening practitioners. Try giving your body at least 4 hours to digest your lunch. Your body is more warmed up but your mind has had time for SO many thoughts. Maybe try starting practice in rest or doing some light pranayama or meditation to re-focus before you begin jumping around. There’s also an element of your presence in the studio. Do you slam it down along with your props creating a loud smack? Do you slam doors or walk heavily? Do your eyes wander around the room looking for an escape route? All of this can contribute to the collective energy of the space. Ways to create positive energy I’ve observed, include introducing yourself to someone new in the hall or while you’re putting your things in the cubby. Sharing a smile when you walk in or bump into someone on their mat. This creates a compassionate environment. A safe place, where you respect one another’s desire to look inward. So while some of these things might seem gratuitous, I suggest you give them a try. As you know, at the end of the day when the details aren’t quite right, it’s all about the company (YOU) anyway and that is the best party you can hope for. How much is too much? What is not enough? I recently had a student ask how often they should practice. This is a tough one. The system says six days a week. But what do we mean by practice? Sure, there is your set of postures. This we all know is 1/8 of the pie. Anything that brings you closer to discovering your purpose, living fully is practice. Why are we practicing? To gain Samadhi – a oneness/union, freeing ourselves from the illusion that what we feel and identify with is NOT actually reality. So we are using this Ashtanga system to move our body around with elaborate, sometimes tiring, shapes so that our mind can chill out. Training that membrane to focus so that you keep identifying with its desires. So do I think a physical practice is important? I certainly do. Taking care of your body keeps you actively participating in your life. Just from a physical perspective, yoga has made me feel strong and given me more energy. But it also does so much more than that. Do I practice six days a week? Yes, most of the time except for my menstrual cycle. Those six days are not full throttle. It would be an excellent way to get injured if I did. I don’t do all of my set poses every day. My senior teachers have said that fewer postures executed with concentration is better than a zillion with a distracted mind. Two days a week? Not quite enough to see behavioral and physical benefits. If you’ve had a lull in practice (we all have) and you’ve fallen a bit off the discipline path you might notice yourself getting frustrated because you can’t remember the sequence or you have to dial it wayyy back. But who is to say? But honestly, discipline has its limits. I’m not here to sacrifice my friendships due to physical practice or staying up late with Derek to watch a movie (fall asleep on the couch.) I also know though that if I’m slacking off too much than I get cranky and sluggish. Equanimity is a forever project. I also happen to be a person that only runs when being chased. I enjoy the postures for their strength building on their own and then pair some counteracting exercises for maintenance. If you enjoy other physical disciplines than five or six days a week of intense practice is not so realistic or for that matter, healthy. You can practice that focus while running or spending time with your kids. There is a reason that family time is called seventh series because it is harder than any of the other six. How do we measure if our practice is working? Michael used to give the example that if you notice yourself staying calm in the Whole Foods line when someone in front of you is paying in change, then it’s working. Get your physical practice in when you can but keep up the active self-discovery and participation up daily. Happy Holidays and New Year to you! “Man, I wish I started yoga when I was fourteen years old!” We’ve all said some version of this. It would just be soo much easier. The binds, the backbends, the will power. Physically, yes this is true. Your body learns and heals faster when you’re a teen. But what would you have been able to use your physical practice for? How would it have changed your behavior if everything just came naturally? In our summer philosophy course, my teacher David Garrigues said that the older you get, the more opportunity for suffering you have. WHAT?! Yes! More opportunity for obstacles because facing, observing, and possibly overcoming them means growing as an individual. Challenges force you to question who you are, your purpose and what you want out of this slice of the universe. Hey, even if you had started yoga at fourteen there would STILL be challenges. Frankly, I would argue that it would be beneficial to study a different discipline so that could learn something exciting and new rather than leaning into your strengths. Sri Swami Satchidananda writes in his translation of The Yoga Sutras of Patanjali, “Yoga practice is like an obstacle race; many obstructions are purposely put on the way for us to pass through…We seem to need to be challenged and tested in order to understand our own capacities…If a river just flows easily, the water does not express its power. But once you put an obstacle to the flow by constructing a dam, then you can see its strength in the form of tremendous electrical power” (2012, p. 48). It’s true. Daily practice requires physical expressions and a quiet mind. This helps us better understand who we are beyond the mind chatter and physical projections. Our attitude and expectations impact our experience. Opportunities often yield gratitude. Thanks for the chance or the experience. If we look at these physical challenges as negative then we’ll never truly understand what we may learn. It is our choice how we experience the world. The Hatha Yoga Pradipika says that enthusiasm and perseverance are basic requirements for success in yoga. Treating each practice as brand new, listening for the lessons. When presented with a challenge you can grimace, push through pain, quit altogether OR you can learn the mechanics of your anatomy, test your physical limitations and accept them graciously for what they CAN do. You can also listen to what goes on in your mind. You could berate yourself, identify with your body as your entire being OR you could enthusiastically listen to your body’s direction and compassionately watch what passes through your mind. I listen to roughly one podcast a day while walking Gypsy in my neighborhood. Usually NPR related because they offer such a wide variety and I have come to trust them. How I Built This, TED Radio Hour and now Hidden Brain are alongside yoga and spirituality based ones like Chitheads, The Jordan B. Peterson Podcast, and Asana Kitchen Podcast. Lately, it seems that so many episodes are devoted to self-awareness and improvement, sustainable relationships and God/the Universe. We are in an era where we can dissect the reasons WHY we make certain choices, WHO inspires our decisions and WHY our actions matter. This is not unlike the Yoga Sutras, the manual for stopping thought and being united in a blissful union with all that is True. This practice allows us to wrestle with these questions. We establish a language we can understand: arms, legs and the buttocks so that we can communicate. Developing control to recruit or relax them. We can discuss based on our own experiences, emotions that flare up, or eyes that wander because although we are all uniquely shaped, we share many of the same fears and desires. I personally want to surround myself with people who elevate me. Folks who support me but also challenge the reasons why I am doing things. Is it because I believe in Karma? Will my intentions in my thought processes determine the outcome of my choice? Do I believe that we are all interconnected, the same divine essence? In David Garrigues Yoga Sutras course suggests (I’m paraphrasing) that getting to know these thoughts and our bodies allows the seer, (the true self) something to experience. The idea that our “material,” our body and mind, can produce our dharma or purpose. This can be a lonely endeavor, which is why our community is so important. Even though we are independently moving, we are all looking to be better in some way. To observe ourselves and use that experience to build empathy for others. To see whether or not our thought patterns in physical practice can train our mind to see results from our choices. Also to wonder why we have gratitude? Is it to God/Universe? Are your actions rewarded in some way? I see all of these questions in these podcasts and think how grateful I am for having a system that offers insight into HOW I can begin to know myself and train myself to make better informed decisions. By starting with a physical practice surrounded by others that both challenges and inspires us we can spend time reflecting on the results of these choices. Dedicating time to listen for my purpose and reflecting how I can live it fully. “Stand up straight, you silly girl!” Mrs. Haddad would say to me. She was my ballet teacher but she could have been a Navy Seal as far as I was concerned. We would practice standing up as tall as we could while imagining we were holding “Mommy’s large china plate.” The idea was that wherever we moved this imaginary plate, we would stand proudly with long necks, chests forward and shoulders back and down. She had a way of instilling the discipline of good posture. She taught me that the way you hold yourself is indicative of how well you believe in yourself and offers more opportunity for connection. True, in this case, connection meant between the music and me. Learning to evoke emotion through movement. It also meant connecting with the audience. Using technique to allow the body to move more freely through grace. Turning choreography into a living emotional experience. Practicing yoga operates in a similar way. A proud, erect posture is no different than samasthiti. It requires a degree of necessary pride because it takes discipline to uphold, a certain level of grounded “togetherness.” Consistency is required to progress through the technique of the sequence of steps. Unlocking areas of the body and making them free and strong. Coming to practice and fully embracing emotions without letting them direct you. But there is no music nor audience. Your breath creates the rhythm and your willful concentration creates the connection to what is the true self. How you carry your body as you walk around offers insight into your mental and emotional health. The yoga practice will help you to control your muscles and skeleton so that you can walk tall. However, it’s so easy to go right back to poor postural habits once you leave the mat. This is where the connection piece comes into play. Having had the opportunity to connect with yourself on the mat, can you uphold that or at least periodically tap into that connection elsewhere? I find the simplest way for me to dip back into this connection is to adjust my posture. Bringing awareness to my steps. While I am walking am I looking at the floor or directly in front of me? Imagining that if I were to run into something it would be my chest first, my head staying back in line with my shoulders. Where is Mommy’s plate?! Staying disciplined to stand erect and meeting people at eye level. Meeting someone directly in that way allows an opportunity to see the other person and to be seen myself. Creating room for connection. Not needing an audience to project. I would suggest as your own social experiment, seeing the effects of an upright posture as you go throughout your day. Even setting a reminder timer midday to check in. What does it do for you? Does it provoke anxiety at being seen by others? Does it make others feel at ease? I know what it does for me, but I don’t want to give it all away or impact your experience. Also, I don’t believe there is anything wrong with being silly. I enjoy being silly! BUT if I am to take myself seriously and make a difference in how I interact with myself and connect with others, then I need to walk tall. I often receive messages that folks are intimidated to start Mysore style yoga. “It looks too advanced.” I certainly understand why! If you google images of Ashtanga Mysore style you will see some crazy stuff. Legs behind heads and confusing twists that both look inspiring and impossible. No one starts that way. It’s like looking up baking recipes and thinking you should start with a chocolate soufflé. I once had a new student describe Mysore classes as “Yoga for adults” because you are taught bits of choreography at a time. Ultimately, it’s up to the practitioner to remember and execute postures in accordance to their breath and ability. The teacher will potentially point some patterns out or new approaches but in the end, the student makes the decisions. In my opinion, this level of student independence is crucial to personal development. As in, the desire to be a better human for you and for others. Empowered with repetitive technique, the student can take practice anywhere, learning to trust their body and what it needs. It sounds easy but it takes discipline! (Yoga for adults.) Taking responsibility for your actions. Showing up to your mat or rug and dedicating some minutes to LISTENING! Not asking your body to play along with your mind’s intentions but the other way around; using a familiar framework to go inside. It would be much easier to be told what to do every turn. At least I think so for me! Inhale stick my foot here, put my arm here…blah blah. But in truth, so many of us already spend so much of the day doing that already! You have projects to get done and someone or something that demands things of you. Treat yourself to some self-guided yoga. Yes, in the beginning you are taught the steps, but over time you can enjoy the freedom that practice creates; challenging your beliefs and conceptions of who you really are and what you are meant to do. I have certainly felt self-imposed pressure in physical practice. The thoughts,"I should be able to do this by now!" and "Shouldn't this posture be easy?" These are usually met with a grimace. A dissatisfaction with myself. I see this in my friends as we turn thirty this year. Somehow the new decade measures levels of success in adulthood. How far in career and an intimate relationship we should be or owning certain things. And when we haven’t met certain steps, there is a disempowering fear that without these goals or items, life will derail. Perhaps we will succumb to loneliness or an acceptance of weakness. I see this in my brother and his friends as they graduate college. Pressure to figure out next career steps. They have studied for an extended period of time and yet it doesn’t create an obvious path. Even when they make plans, sometimes they realize that they no longer want what they thought they did. This fear that every step could easily prevent a chance for happiness. Measuring our lack of ability to reach these “ideals” or goals that we ourselves or society has set doesn’t give us a chance to question our purpose. To pursue enough wealth that allows us to make our own choices. Why are these goals set and who set them. Why is my inability to do “X” well, embarrassing instead of an area of growth; a steady evolution in my own time. These fears of should-haves and weaknesses in character give opportunity to build strength. They are not shameful or another item to add to your list of faults. It is not something you should fix, but experience for yourself. This is what I tell myself when I get entrapped in fear. 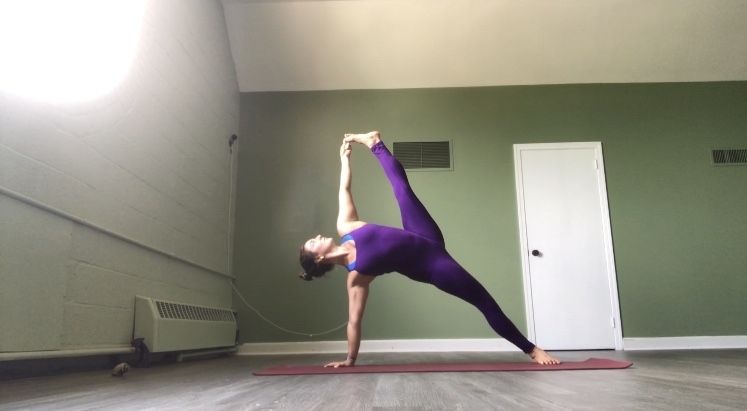 I’m currently experimenting with my physical practice in such a way that might create lots of asana issues; exploring my physical weaknesses and seeing what shows up. Maybe what I thought could only happen one way can actually include so many more avenues. This rule-follower is excited to throw away the should and research the why. Healthy questioning that I hope will permeate into my third decade of life choices. Standing silently at the front of the room reminds me of my role. Not to fix but to simply function as a mirror. Say what you need to say out loud. Tense your jaw, shake your head, squint your eyes, even lose your drishti. But I hope you also exhale deeply, spread your eyebrows & laugh. These reactions reflect who you think you are. What you say to me, you really are saying to yourself. You have God/truth/the whole universe inside of you. How could you not be enough? This bind does not represent whom you are inside. It can’t be measured with a clasp of the hands. What is THIS exactly? What is your image of perfection? Are you imposing a certain end point on your body? Let’s shift then. Sleep more? What are you eating? What patterns are making you less vibrant? Is it a pattern you can change? If no, then let go. Are you moving with intention and breath? Everything else will fall into place. Breathe and just go. What are you receiving from practice? Feel stuck, motivated, joyful or bored? You know through consistency that these feelings change. Respect that and monitor your ability to evolve as a person. Reflecting back on what you’ve said out loud or in your head, breathe compassion and remind yourself of the perfect unchanging piece inside of you. Surrender everything else to change. The real you will remain the same. Anxiety has been at the forefront of my reading material lately and also has been brought up in many conversations in and out of the yoga room. I am surprised with the number of folks, like me, who have experienced panic attacks or extreme anxiety and also relieved that I am not alone. This practice has both helped me mitigate panic attacks but also occasionally increased my anxiety! Why is that? I think it has to do with the increased ability to focus on the breath, creating more awareness of the body’s movements and therefore becoming more present. It also requires that you persist through uncomfortable situations. Many of you may remember the first couple of supta kurmasanas, feeling constricted, bound, stretched, in a dark hole that you created with your own legs! Or maybe in the classic example, of kapotasana where you need to “crack” your chest open and vulnerably trust that your feet are somewhere back there for you to grasp. Then you learn to stay, breathe and soften. This can translate to real life situations pretty easily. You may start to pay more attention to your breath while you are at work or you are more easily aware of your thoughts while you are folding laundry. You begin to process what is true or what you are avoiding. For me, yoga has forced me to take a look at the negative thoughts that I wished to avoid and bury away. In Ashtanga, you are BY YOURSELF doing your practice. If you don’t like what those thoughts are telling you or you struggle to be alone with yourself then its time to face those thoughts. This is HARD WORK! Like therapy, sometimes it is harder to manage before it gets better. We are spending less and less time alone, free from distractions. Use your practice wisely. Let it move that body you have on loan to change your daily actions and world view. In fact, if you haven’t started watching your thoughts and questioning their validity and origin then you might want to practice a little more often and passionately. If you aren’t altering your mental bandwidth and becoming a more grounded, aware, kind person then what the hell are you doing on your mat for 90+ minutes??? You are wasting your precious time worrying about that bind. I am currently reading “The Charisma Myth” by Olivia Cox Cabane and she spends a great deal of time talking about anxiety & self-doubt and how that impacts our successes in life and our interactions with others. She says that during a panic attack, “the mind thinks we’re in a fight or flight situation, declares a state of emergency and shuts down what it deems to be superfluous functions. Unfortunately, that means the body is reducing our cognitive abilities just when we need them most…rest assured that this reaction is an entirely normal, natural one.” She goes on to prescribe visualization techniques to help calm the anxiety. Where do we use visualization techniques? IN PRACTICE EVERY DAMN DAY! Can you actually see your sit-bones, bandhas, diaphragm? Nope. But you visualize them and reorganize your internal self toward samastihi. This is no different. If you have a panic attack or some anxiety before a meeting you can set a timer (20 minutes for a full-on attack) and do your alternate nostril breathing with the sweet little ball that expands and contracts. I'm almost finished with David Garrigues’ “Yoga Sutras Book 1 Summer Course” and fireworks have been exploding in my brain. He demystifies the connection between the physical asana practice and the guidelines in the Sutras' text. He discusses the recipes for stopping thought, realizing one’s true nature and discovering our unique purpose in this life. WHOA. I could discuss this for hours and with some of you I have. Some of you have walked right in as I am processing this information and I blurt out an unpacked phrase, perhaps sounding even a little crazy. I used to hear the phrase “The mat is a mirror of your life.” I would think….hmm interesting. Yeah, okay…makes sense. I’m being lazy during X and so therefore I’m probably not paying attention somewhere in my life blah blah.. I am here to tell you that I am now ENRAGED by this phrase (thank you DG.) As David puts it, the mat is a laboratory or a training ground to learn how to use your body and your mind. You have dedicated time each day to practice higher levels of thoughts such as meditation on the breath or arranging your body along the imaginary central axis so that you can dispel all thought. Thoughts that are often fueled by desire and suffering (among others.) Your mat is a training ground to practice positive thought patterns that directly influence your thought patterns the rest of the day. THIS IS HUGE! This is not a passive practice. This is not simply exercise. Yoga and in our case the Ashtanga practice assumes that we all have these problems, desires and pitfalls in our nature that cause us to think that we are only our body and our memories. Instead, the Ashtanga practice is intelligently designed to awaken your awareness to the one unchanging piece in you, your true self. To separate what changes from what doesn’t. And we can realize this through the simplest series of postures. You don’t have to do your whole freaking practice every day. This is training so you can get out of the illusion that you are your body or your suffering. This practice has the potential to elevate your thinking and bring about wellness in your body too. This is YOUR practice. The work is up to YOU. You have to face suffering and look at what is real and true. You are not doing a pose because ahhhhh this feels so good or this music really jives with this flip-dog. This is your life right here in every moment and there is no time to waste. When you practice, each jump out or inhale is an opportunity to align yourself to the truth, to the awakened unchanging self. So, no. No mirror. No mere reflection. Train yourself to elevate your understanding. With that, you are RESPONSIBLE for taking that into your life and applying it. To be an example around others and to react with compassion and joy, which the sutras say are finer thoughts than anger. You are encouraged to find your purpose. I’m stating this to you but I am even more so writing this for me too. I needed to hear this through this summer course. To remind myself that I am lucky to have found this lineage that is designed for me to discover my truth.